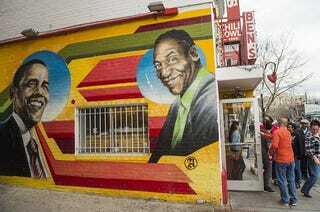 A mainstay in the African-American community has changed its mural and taken Bill Cosby—the man who put it on the map—off of it. Ben’s Chili Bowl restaurant in Washington, D.C., a onetime hole in the wall made famous for its hot smokes and chili, once exhibited a barrage of famous African Americans on its side wall, including former President Barack Obama, Muhammad Ali, Prince, Harriet Tubman, and local celebrities Taraji P. Henson and rapper Wale. Cosby’s image, however, is no longer there. “It’s kind of shocking to see Bill Cosby is down after he’s been here so long,” local resident Vivian Staine told reporters. Cosby was part of an original mural of stars put up in 2012. On June 17, the once-beloved entertainer had a mistrial declared in his sexual assault trial regarding a now former Temple University employee. This week, in a ceremony featuring local comedian Dave Chappelle, Ben’s unveiled a new expanded mural, minus one person. Owner Virginia Ali, 83, says that the restaurant recently ran a poll on who should be included, and the Obamas came in first and second place, while Cosby did not place in the top 16.